Last week I was involved in a project in North Wales; the construction of a giant mask puppet for Welsh writer Angela Roberts. Angela has had a long and varied career, writing for television, film and radio as well as a selection of novels and children's books. 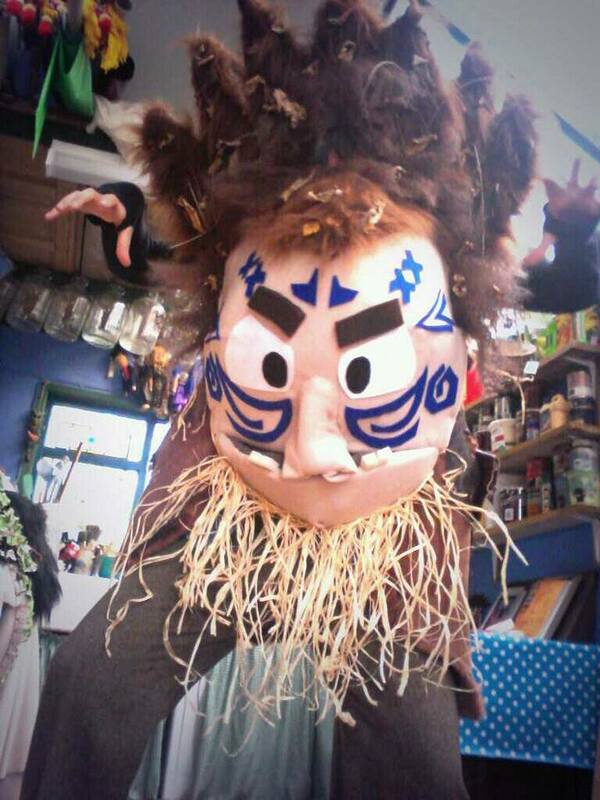 Her latest project is a theatre adaptation of an old Welsh folk tale; the story of "Rhita Flewog". Rhita is a seven year old boy giant who desperately wants to be tough and scary; he travels around stealing beards from human men to try to cover his own hairless chin. I was invited to stay at Angela's beautiful home in Bangor and build the giant, ready for his debut that very weekend. Given the nature of the puppet and the with a close deadline, this project presented a significant challenge. I had never built anything quite like this before and though I would have loved to experiment and discover new techniques through play, with the time limitations in mind, I was forced to concede that I needed to stick to what I know. The majority of my previous work, making, has been with "Muppet" style lip sync puppets and as such I approached Rhita's construction in the same way, with one key difference. Due to the size of the puppet and the nature of it's operation, it was important to create a strong, durable internal structure that would allow the puppet to function well and hold it's shape. Here was a chance to work with a new material, one with which I have had no prior experience: cane. With plenty of guidance from Caroline Astell-Burt (head of the London School of Puppetry where I am currently enrolled), I was able to create a frame for the giant. Surprisingly simple to manipulate, the cane was used to create a structure spanning from my groin to well above my head, to support the puppet's face and hair and allow the puppeteer to fit snugly inside for easy operation. I then proceeded with the construction as I would with one of my smaller lip sync puppets, with materials I am very familiar with, foam and polar fleece. Having a background in suit performance in Melbourne, I knew the hardship's of performing inside a character and as such tried to create a more pleasant experience for the performer who will eventually operate Rhita in Angela's production. I left the top of the head/hair completely open, to allow airflow and plenty of room around the bottom of the structure as well. When performing with the puppet at his debut, I really appreciated my own foresight. Rhita made his debut on the streets of Bangor on October nineteen and was received incredibly well. The workshop that followed, run by Angela was also a huge success and a great opportunity for me to mingle with the local people. The process of building Rhita was very enjoyable and I was quite happy with the final result. I can not thank Angela and her husband Dyfan enough for making me feel so at home in their house and workshop. It was a lovely week. Angela has received some funding from the Welsh Arts Council for the development of this project and last weekend marked the first stop on the way to it's realization. I am looking forward to hearing how it all comes together and wish Angela every luck with it's continuing development.